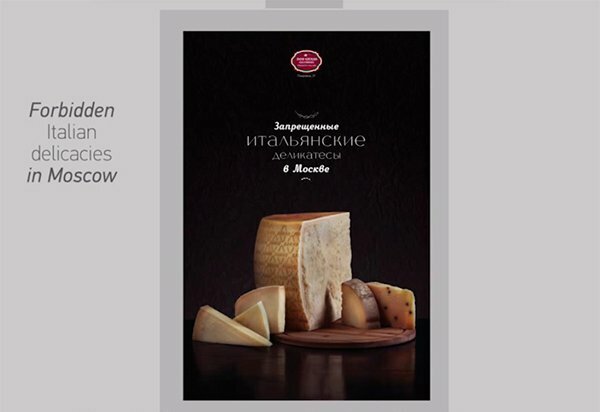 An Italian delicatessen in Moscow has found an ingenious way to advertise its remaining stock of cheeses whose import into Russia is now banned: a street-level billboard that can be seen by anyone but the police. When a policeman passes by, and is detected with the help of a hidden camera, the billboard switches from saying “Forbidden Italian delicacies” to “Best Matryoshki in Moscow”. The billboard is located near the Ministry of Internal Affairs, and reactions to it have been recorded in a video with over 95,000 views on Youtube, which makes Don Giulio Salumeria’s cheeses less of a secret, and more of a viral stunt. The marketing campaign was, in fact, devised by Krasnogorsk-based advertising agency The 23. Don Giulio Salumeria was one of several shops to suffer from the food ban, which saw the import of meats and cheeses from the European Union halted by Russia as a reaction to western sanctions over Ukraine.